If you're a parent suspecting that your child may be affected, any autism symptoms checklist found online is bound to be inadequate. Seek professional help immediately for a more thorough checkup, as time is of the essence for effective treatment. Hemming and hawing for months about an inconclusive self-diagnosis can have a noticeable impact on your child's future. Having said that, it is good to know what to look for. Here is a compilation of warning signs that may indicate it is time to escalate the situation. 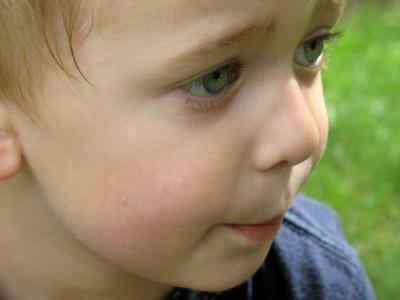 Lack of eye contact - Autistic children tend to avoid eye contact, even with parents. Failure to respond - Ignoring requests to do chores or pretending not to hear "No" is one thing, but acting deaf a lot of the time is a completely different story. If your child consistently does not perk up when you call out his or her name, this may be cause for concern. Scripting - Instead of responding per the above symptom, the child repeats words or phrases from the TV, toys or other sources, over and over instead of normal dialogue. Strange behavior - There is an almost infinite list of "strange behavior", and many normal kids do weird stuff on a frequent basis. What sets the autistic children apart is often the level of weird, coupled with the tenacity in which the behavior is pursued. In other words, a kid banging two toy trucks together again and again for five minutes is a little strange but not necessarily out of the ordinary. A kid lying on the floor, kicking his feet so he spins around and around on his forehead for two hours straight is more troubling. Gut feeling is a good guide here. Resistance to change - Like the previous symptom, there's a bit of a gray area here. Normal kids can be quite persnickety about food, clothes, grooming routines and whatnot, insisting things get done "right" or there'll be hell to pay. Again, severity and tenacity makes the difference. Insisting on having sandwiches cut diagonally is quite different from throwing an absolute tantrum about the parent starting clipping the toenails on the left foot before the right foot. Inexplicable actions - Sudden unprompted mood swings, severe anxiety and tantrums can be quite unsettling, especially if the child does not recognize your presence or make any attempt to give a reason. Or it could be the other way around: giggling wildly for no reason whatsoever, while not offering any clue as to what's so funny. This is another symptom that should be taken very seriously. Poor motor skills - Some people with autism can be quite nimble, but many have uneven motor skills. This may show itself as difficulty drawing or holding utensils, jumping and climbing, or anything in-between. Perfect symmetry - Few people with autism are like Rain Man, and the stereotypes on mass media by no means cover the whole autistic spectrum. However, if your very young child seems exceptionally skilled at arranging blocks and colors in perfect patterns, be observant. It's not the kind of symptom that is necessarily damning all by itself, but keep a very close eye on other strange behavior. Again, if your child is displaying concerning signs from the autism symptoms checklist above, play it safe and seek professional help for a more accurate diagnosis. Also bear in mind that it is far from certain that your child HAS autism just because he or she has a few quirks in line with these symptoms, so don't panic. The best way to help your child is to keep a calm, rational head. Don't jump to conclusions or gloss over and rationalize; just go straight for the facts as quickly as possible. Either you'll get a professional reassurance that things are ok, or you'll be well positioned for that all-important early intervention.